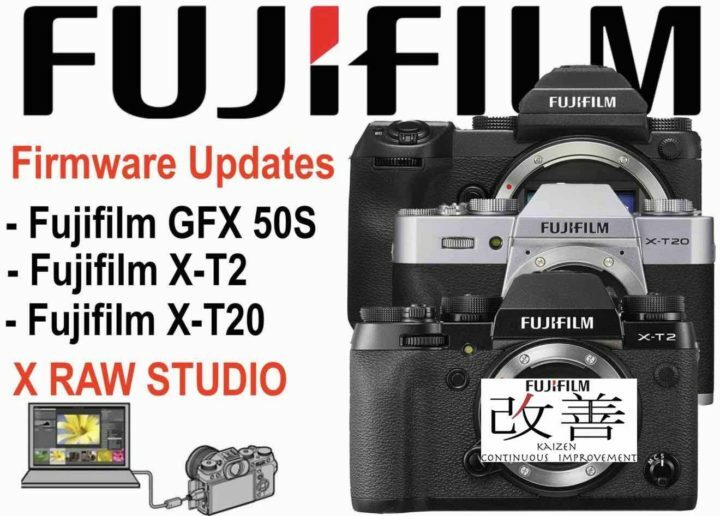 Fujifilm has just released the Firmware updates for the Fujifilm X-T2, X-T20 and GFX 50S. All the details and download links below. First looks at the very bottom of this post (continously updated). Fujifilm X Acquire ver. 1.7 is out. Adds backup / restore function. Download the Mac or Windows version. And for Fujifilm X-Pro2 and X100F owners: your firmware update is scheduled for late December. You can read here what it will bring you. New AF tracking algorithm for moving subject: Thanks to the newly developed image recognition algorithm, the update enhances AF-C to track moving subjects twice as fast as previous firmware. In addition, the update also enhances tracking to be able to capture up to 50% smaller moving subjects than before. Support “FUJIFILM X RAW STUDIO” for Macintosh: Once connecting a camera to a computer via USB cable, the “FUJIFILM X RAW STUDIO” enables users to convert RAW files with X Processor Pro. The fast batch processing will also be available. The “FUJIFILM X RAW STUDIO” can be downloaded from the FUJIFILM website for free. Improve radio flash controller usability: The upgrade allows users to shoot with compatible third party studio flash in high speed sync. or TTL mode via their radio controllers. Support for backup/restore of camera settings via “FUJIFILM X Acquire“: Once connecting a camera to a computer via USB cable, the “FUJIFILM X Acquire” allows users to backup/restore camera settings to/from a file. Copying all camera settings from one camera to another is available. *”FUJIFILM X Acquire Ver.1.7 Installer for Windows/Macintosh” can be downloaded here. Support for “Instax SHARE SP-3“: Additionally,” Instax SHERE SP-3″ has become compatible with this camera. RGB histogram display and highlight warning: If you press the function button allocated to the histogram, RGB histogram and highlight warning (High brightness portion will blink.) are displayed. The phenomenon is fixed that exposure compensation is not correctly reflected to brightness of live view on LCD and EVF when ISO setting is “AUTO”, exposure compensation is “C” and it is changed by the command dial. Touch panel operation when using the EVF: The firmware update will make it possible to use the touch panel while looking into the viewfinder. According to the operation method, it’s possible to set the effective range of the touch panel to the full screen, right half, left half, or OFF. Support for “Instax SHARE SP-3”: Additionally,” Instax SHERE SP-3″ has become compatible with this camera. Addition of “Eye Sensor + LCD Image Display” in the View Mode: The update gives the “Eye Sensor + LCD Image Display” option in the View Mode that allows you to shoot through the viewfinder and check images on the LCD, just as you would with an SLR. ON/OFF for 1/3-step shutter speed adjustment: The update allows you to turn off the Command Dial’s function to adjust shutter speed by 1/3 steps in order to prevent unintended adjustments. 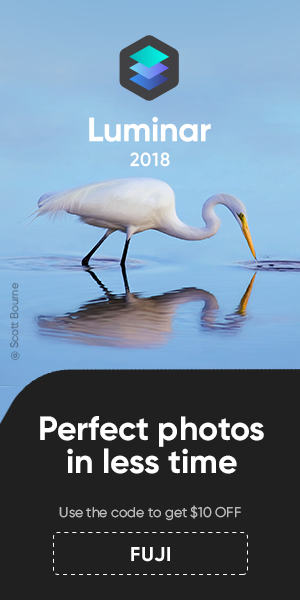 Addition of “Shoot Without Card” mode: With the update, you can have the “Shoot Without Card” mode turned OFF so that the camera will not shoot when there is no SD card inserted. Addition of “-6” and “-7” to EVF’s brightness setting: The update will extend the “EVF Brightness” setting options to “-6” and “-7” so that, even in an extremely low-light condition, the brightness of the EVF does not distract you from shooting.